There’s a lot to say about the most recent series of Sherlock, but I think it’s best to wait until after next Sunday’s episode. While there isn’t much overt evidence of an overall arc, there have been a lot of little clues which will presumably be resolved in the final episode. What is worth talking about is a common complaint I’ve seen about The Sign of Three: the idea that its mystery plot “could have been told in 15 minutes”. I can understand why people feel this way. It’s the second character-heavy episode in a row, and the mystery plot of The Empty Hearse really was very thin. But the idea that because the relevant scenes comprise a short amount of screen time the whole arc could be compressed down fundamentally misunderstands the importance of elapsed time in storytelling. If you have two elements, A (the set-up) and B (the pay-off), the distance between A and B can be just as important as the content. In the case of The Sign of Three, the mystery side of things was structured around one key moment, the point where the young boy suggests that the unknown murder method from the first case could be used by the unknown man from the second. The intended effect is surprise, the linking of two apparently disparate plot points, one of which you might have all but forgotten about. But for a surprise to be built on separation and sudden recall, the relevant plot points have to actually be separated, and the audience needs to have time to forget. That wouldn’t be possible if all the relevant scenes were squished together. This is part of the reason why mystery shorts are so much harder to write than novels: there often isn’t enough space to separate the elements which need to be linked in the solution. Obviously this doesn’t refute any accusations of padding. Just because anything can go between A and B to create sufficient separation doesn’t mean that anything should. But never underestimate the importance of giving plot elements a chance to breathe and giving an audience the time to forget. Recent Doctor Who is an example of a show botching this important concept: because of the short running time, plot elements are often introduced mere minutes before they’re resolved. It doesn’t matter how clever an arc is. If you don’t give the set-up enough time to sink in, the pay-off isn’t going to have any resonance. I wrapped that point up unusually quickly for me. How about another one? One of my favourite discussions to have with clients who ask for help with mystery elements is clueing. There are lots of aspects to this, but The Sign of Three offers a good example of what the balance between how “obvious” a clue is (i.e. how likely the audience is to pick up on the clue’s true significance) and what I call its “volume” (i.e. how loudly a clue makes its presence known when it’s announced). There is often, but not always, a inverse relationship between the two; the more obvious a clue, the more quietly it needs to be introduced. The loudest or most overt type of clue is often the mystery itself. This will be a direct challenge to the audience, a suggestion as to where they should be directing their attention. An example in The Sign of Three is the body of the wounded guardsman. How was he stabbed? But a single mystery can be tiring over the length of a story, especially if the audience can’t make any progress and doesn’t receive any new information. To counteract this, you should also focus strongly on oddities that you’re confident are hard to solve or can’t be solved without the help of other, quieter clues. An example of this would be the connection between the female victims of the May-Fly Man. The solution is fair, but tricky to work out, especially because it’s obscured by a red-herring. Sherlock is right that they work for the same person, but visibly discards that idea. Which would be a cheat, if the women didn’t all admit that they had a secret. This last is another example of a loud clue, and it has to be to ensure the audience knows to distrust some of the earlier information. A moderately loud clue is one that draws attention to itself but where the audience doesn’t know they should be thinking about it more. An example might be Tessa using John’s full name: it’s odd enough that most people will notice it, but because none of the other characters react at the time, it isn’t certain that it’s important. Drawing attention to something and then quickly dropping it is a common way to use this kind of clue, as is hiding information as (or near to) a joke. It’s hard to laugh and think at the same time, and audiences are often willing to follow a (potentially false) line of reasoning for a joke. Another method of dealing with moderately loud clues is to give the false impression that they’ve been completely resolved. In the telegram scene, one telegram reads: “Oodles of love and heaps of good wishes, from Cam. Wish your family could have seen this.” This is (presumably) a clue that Mary is involved or being blackmailed by Charles Augustus Magnussen, the villain of the next episode. Mary is visibly troubled by this, and John comforts her. But he, and the audience who don’t twig that “Cam” isn’t a name like “Cameron” but the initials “C.A.M.” is allowed to think that Mary is reacting to the second part of the message. We know that she’s an orphan, and it’s natural that a mention of her family would upset her. The audience’s attention is drawn to the clue, but then they’re immediately tricked into thinking that it’s fully resolved. A quiet clue would be one that is mentioned but not highlighted at all. An example would be the tight uniforms of the major and the guardsman or the man drawing the skewer out of the joint of meat. These are crucial hints to the solution, but never directly alluded to. There are many reasons to keep clues quiet. Often they would be too obvious if they were any louder. Sometimes (as with skewer in the meat, perhaps), there would be no plausible way to draw more attention to them. The risk with quiet clues is that they are so subtle the audience misses them entirely. The usual solution is to have lots of them. That way any given audience member can hopefully be relied on to have noticed a subset of them. The final type of clue is completely silent. This is something that isn’t referenced at all, but which has to be deduced from other information. An example might be that Major Sholto, being a recluse, would need a steady stream of private staff (I don’t think this is ever mentioned?) The danger here is obvious: if too many deductive steps are required, or if the reasoning isn’t sound, then the solution can feel unfair. The best approach here is to make sure that silent clues aren’t vital to the solution of the mystery, or that there are a lot of louder clues to back them up. Not seen any of the Sherlocks, but I understand they’re pretty good. I’m sitting here thinking that I really could have done with reading something like this before I started writing ‘mystery’ novels. Still, never too late to learn something about writing in the genre. Very informative and very interesting. Thanks. 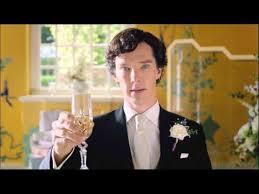 Sherlock is very entertaining and almost endlessly inventive but it generally gets my hackles up. It’s a show that’s almost aggressively about intelligence and the importance of paying attention to apparently inconsequential details, but it doesn’t stand up to even the slightest scrutiny. So it completely fails to mesh theme and content. Having said that, there are very good jokes and fun swirly and whooshy bits, and this most recent episode (while generally so sicklish that you worry you might fall into a diabetic coma any moment) actually made sense from start to finish, so I enjoyed it. More posts on mystery technique to come, although of course a lot of it is applicable to any kind of storytelling. The negative space thing is really important, and something I spend a lot of time on with clients. Because I mostly end up working on polished first drafts (even if clients don’t realise that’s what they’ve got! ), there are a lot of clever ideas where the constituent elements are too close together to have much impact. Which is fine and understandable, because you often don’t know what your story needs until you basically get there, and then there’s only so much time to mention all the things you need to make a particular element work. The redraft is then about taking those elements and moving them as far back through the story as is reasonable. This makes for better, more densely layered stories, but the editing involved can also be complicated and traumatic. Very little of the first draft tends to survive in its original form. But that’s where the meat of real writing lies, I think.